Sust, Fidel (1995): “Epilogue : the sports legacy of the Barcelona Games”. Miquel de Moragas; Miquel Botella (eds.). 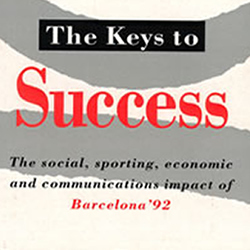 The Keys to success: the social, sporting, economic and communications impact of Barcelona’92. Bellaterra: Centre d’Estudis Olímpics, Universitat Autònoma de Barcelona.